0900x2v is end of life (EOL) with no direct replacement. MetaGeek’s Wi-Spy 900x might fit in your pocket, but this portable USB spectrum analyzer is loaded with big-time performance. 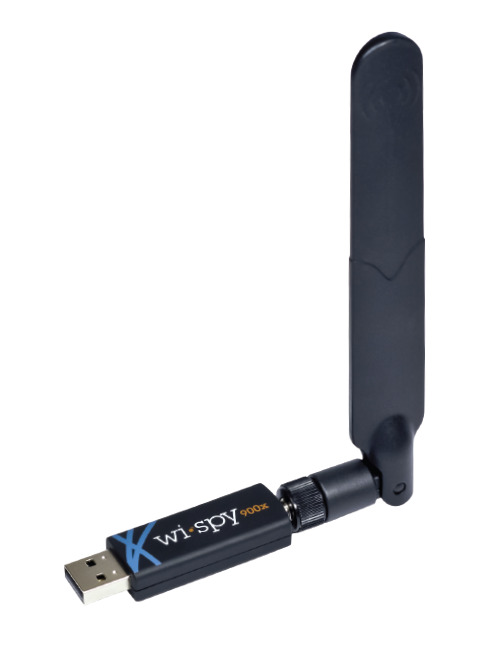 The high-resolution and enhanced amplitude range make the Wi-Spy even easier for you to identify interference in the 900 MHz public ISM bands. With MetaGeek’s compact spectrum analyzer, you can save time and money while installing, troubleshooting and managing your wireless networks. Begin your troubleshooting at the Physical Layer. Let’s face it, the 900MHz band is crowded. That’s why wireless professionals need Wi-Fi tools that quickly isolate RF interference sources and identify the quietest available channel. MetaGeek’s Wi-Spy is an easy-to-use tool designed for IT professionals and wireless network consultants who need a compact Wi-Fi spectrum analyzer to troubleshoot and optimize their wireless networks. Who can benefit from Wi-Spy? Why is Wi-Spy the right tool? • Eliminate adjacent channel interference.